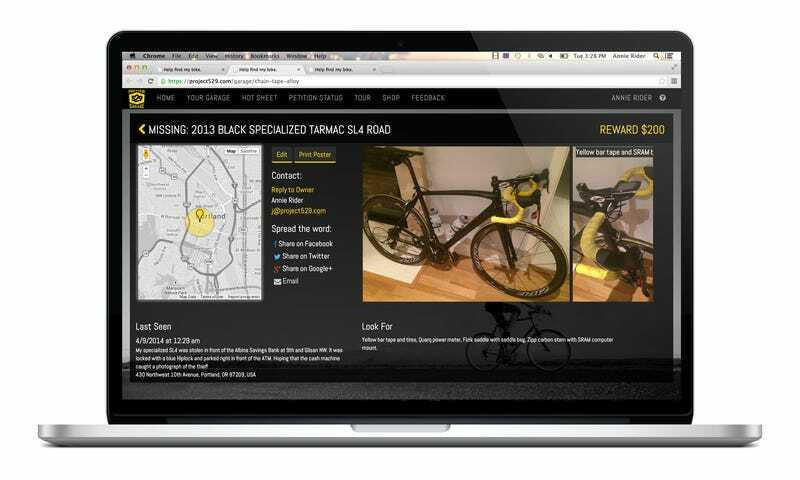 Developed by Portland-area startup, Project 529, this mobile bike security suite is a one-stop destination for documenting your bike and recovering it after it's been nabbed. 529 Garage works as both a web service and companion iPhone app (the Android version is expected to hit beta next week). You first register your bike on the company's website; including pictures of the bike, a description of it, and the other standard details needed to expedite a police report and your insurance claim. This database has been developed in conjunction with—and routinely searched by—several local law enforcement agencies. What's more Project 529 is cooperating with more than a dozen Portland-area bike shops to automatically register every bike they sell. "A big part of our effort is to collaborate with local bike shops, clubs, associations, and law enforcement to advance the rollout and effectiveness," Project 529 founder J Allard told Gizmodo via email. "Our approach on this front is to launch and refine locally and then expand nationally. To this point, we have 13 Portland-based bike shops online with the service that will be hosting a free bike registration day tomorrow (5/29) and we are working with local news outlets to spread the word." Even with the service's local roots, it already boasts thousands of registrations throughout 35 states and that number is sure to grow. If your bike ever is purloined, the companion iPhone app comes into play. With it, you can broadcast a "Missing Bike Bulletin" to the phones of other 529 members in the area. If they see your whip, they can quickly and discretely forward the bikes location and direction of movement through the app to law enforcement and you. If you want even more of a deterrent, the company offers "529 Shields," weather-proof badges that help police more easily identify stolen bikes, for $10 a pop at Project 529. And whether you're interested in signing up for the service or not, do the entire biking community a solid and sign the Project 529 petition asking eBay and Craigslist to require bike serial numbers in their ad listings.